Love my new door. 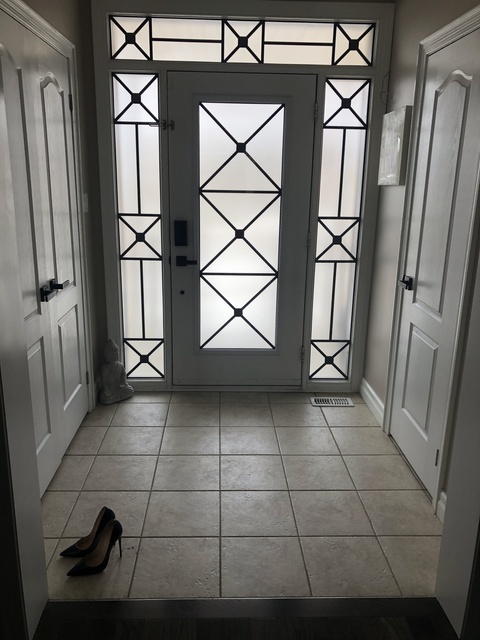 Getting the door inserts replaced was a more affordable option of updating the look of my home vs the cost of replacing the entire door. These guys have the replacement down to a science and replaced it within an hour. Highly recommend their service. Barry at What a Pane was a pleasure to do business with even tho it was done entirely electronically!!! My window insert was a custom design and the price amazingly better than big box stores. Customer service seems non existent anywhere now but I was 150% pleased and with the product as well. I would highly recommend What a Pane. Frontenac, yes as you say 'all electronically'. Welcome to the age of buying door inserts on-line :-) Nevertheless, it was a pleasure working with you on the design. Thank you Michelle, we aim to give the best pricing for high quality inserts, rather than the host of cheap, low quality product that appears in the market. Nice choice of design for your home btw. What A Pane Inc.
Murray just left after installing our door panel and side lights. Absolutely beautiful and we are beyond thrilled! Dealing with What a Pane is terrific ! Murray was professional, thorough, polite and honest. The job was terrific and it looks gorgeous ! You won’t be sorry hiring What a Pane! My neighbours have already complimented the doors and asked who did them! Lisa & Christopher, very nice of you to take the time to write such a glowing review. Customer service is our #1 priority. Thank You! Our son hit a golf ball through our glass door window and what a pane was very quick to respond via home stars. They gave an honest and quick quote after I have sent them a picture of the damage. The service was quick efficient and they even cleaned up afterwards. Thank you!!!! Very happy to be of service. Good to see you now have practice 'air' golf balls to save your windows! What A Pane Inc. I heard about What A Pane from friends and family over the years. 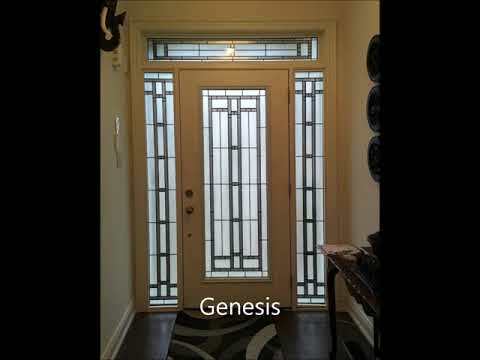 My mom had 3 of her homes’ doors done by What A Pane. What I liked most about the company was that Barry, the owner, always remembered my mother and if she had an issue he was there to answer her question. What A Pane offered many choices at reasonable prices. Besides amazing customer service and spectacular communication- what I liked most is that Barry never persuaded me like a salesman would. He let me think about my design and offered a free quote. 6 months later I decided on a design and never once did he pressure me. I told him that money was a little tight during the Christmas Holiday period and he offered other payment options for me to still have my door installed. The door is gorgeous! It’s worth every penny. Barry and his team worked fast and were very professional. They cleaned up after themselves and were happy to address any of my questions. I highly recommend What A Pane! You won’t be disappointed! Than you again Barry!! 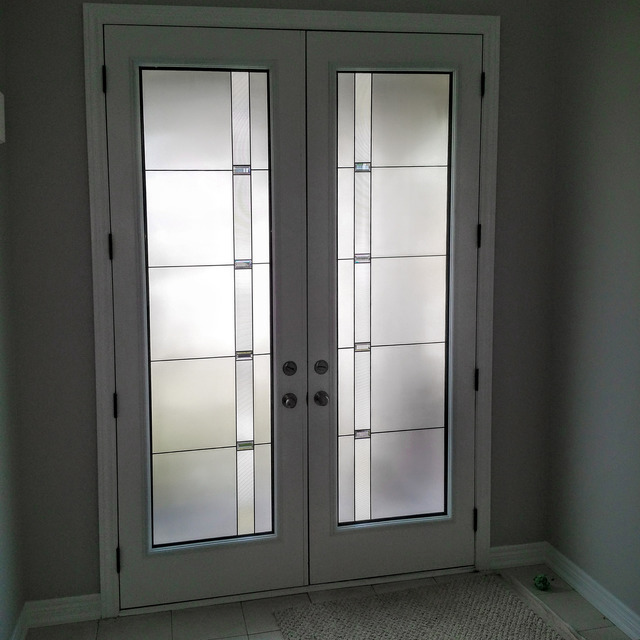 Angeline, Glad we could be of service and help to you in getting your door inserts done. Thanks for choosing us once again! What A Pane recently switched out my front door glass panel and I couldn’t be happier. Very professional, friendly and reliable. Wouldn’t hesitate to recommend them to anyone! You won’t be disappointed. Nice to hear you were please with our work. Thanks for the great review! What A Pane delivered on what they promised. They had the door insert done on time and did a good job of communicating information. Installation was done well and efficiently. The door insert looks fantastic and it definitely adds value to my home. I'm already considering having Barry and his team come back to do the back door and would recommend their work and products to others. Thanks A, Great choice of design for your home and for sure, let us know if we can be of further help. Just a fantastic experience from start to finish. Professional, friendly, prompt, courteous and most importantly - a job well done! Great quality work and well priced. Will recommend to my friends for sure. Thank you and keep up the good work. 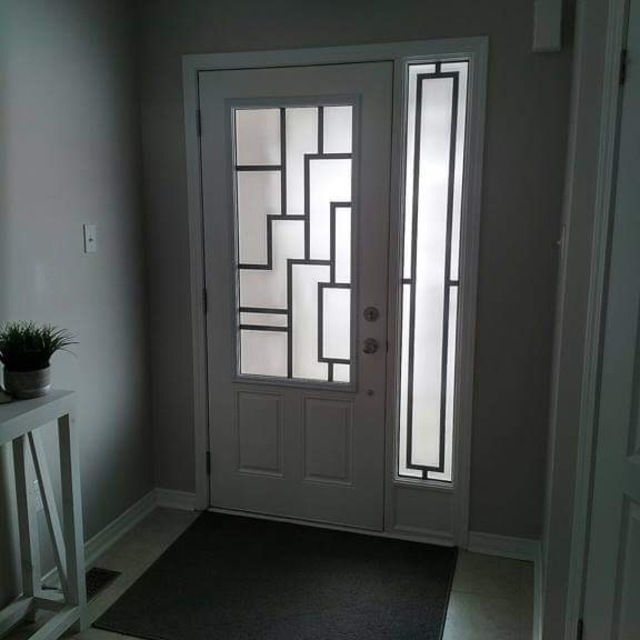 Sharri, Thanks for choosing one of our new What A Pane designs. It certainly looks good on your home. Barry from 'What a Pane' was courteous, professional and prompt. He was able to help me choose the door insert over the phone while I looked at the online photos. I found this to be a real time saver, as it was one less day to be home for an appointment. I chose a full length insert which worried me because my original insert was only 3/4. Barry assured me it would be a quick job to cut the door and install the new insert. On the day of installation, everything was completed in less than 30 minutes, and there was no mess left behind. Awesome customer service, product and installation! As a company, we try to keep two or three pairs of every design in stock at our facility. With this, we can offer same-day installation on a host of products, as opposed to our competitors, who have to purchase from a wholesaler. Our website offers quick and easy access to our designs and photos of installations and as you said, makes it easy to choose on-line. Thanks for the kind words! What A Pane Team. 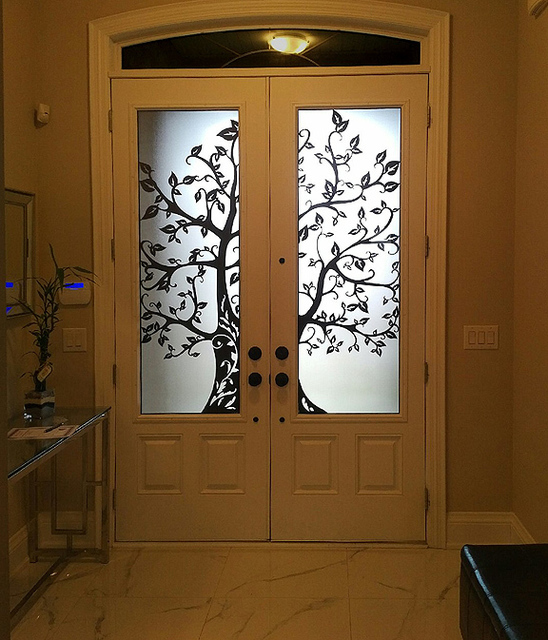 High Quality Wrought Iron & Stained Glass Door Inserts - Toronto GTA Area. 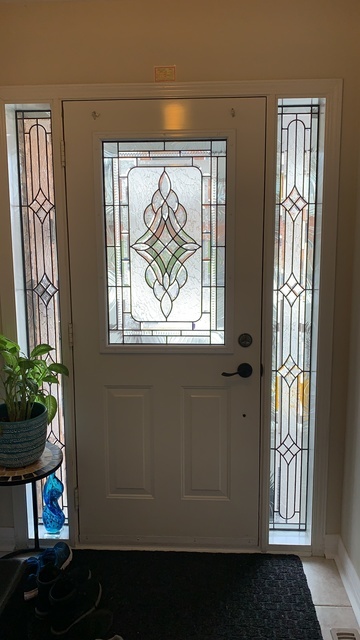 A door says a lot about a home and at What A Pane, we want to make sure that the first impression your guests have of your home is a lasting one. 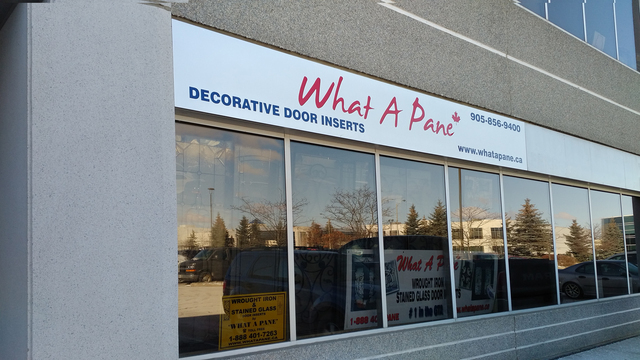 We are one of the few door insert companies in the GTA that have an actual business premises and showroom. 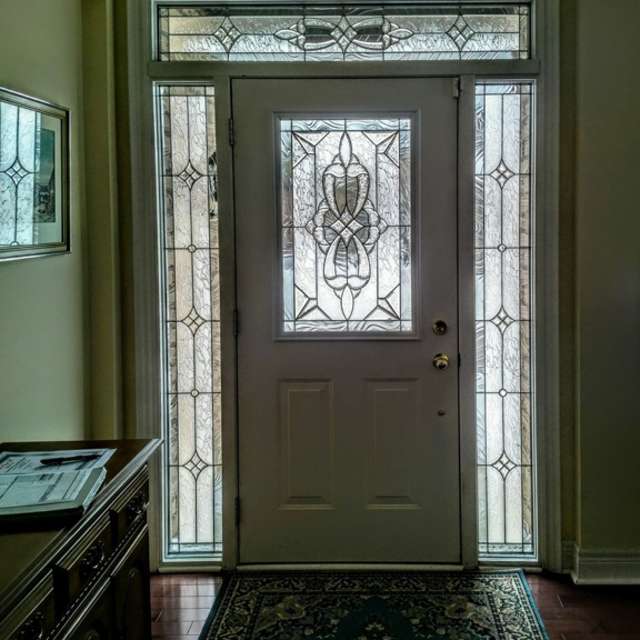 We help to add sophistication, personality and eye-catching details to your home’s front door. 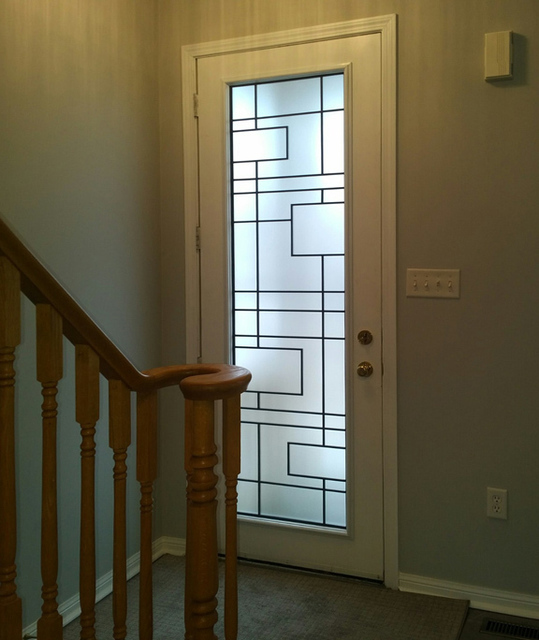 From stained glass to wrought iron work, What A Pane offers the best value in the GTA. Our family operated business, established in 1998, is known for providing quality, reliable services and competitive prices. 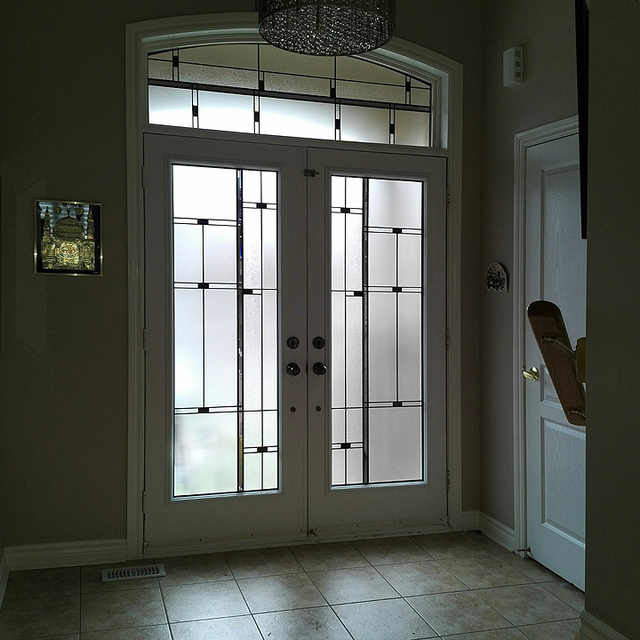 With our design experts, What A Pane continues to the number one choice for beautiful door inserts that Toronto residents love to display in their home. 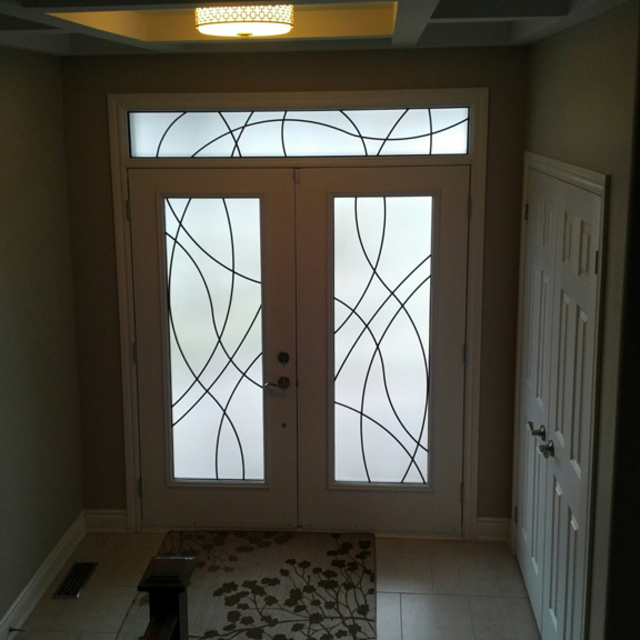 We offer a variety of patterns, textures and designs, so you will have plenty of choice when choosing which door glass suits your home the best. Call or email us now - we answer promptly! 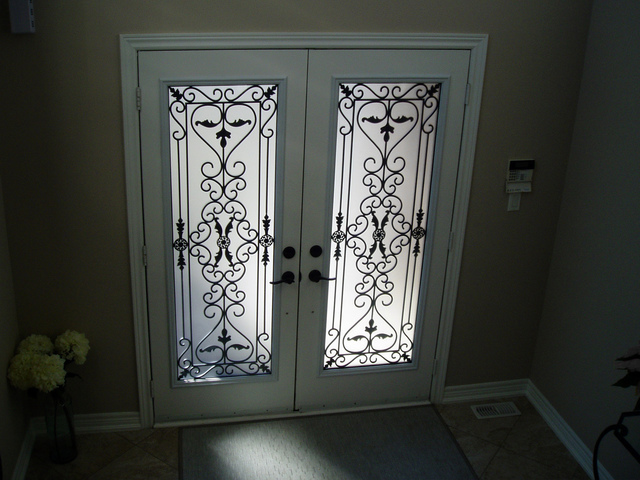 Wrought Iron and Decorative door inserts and window inserts. Interior blinds (Blinds between glass) Sorry we do not supply actual windows or door systems. What A Pane, yes they are our own, not purchased from a wholesaler! 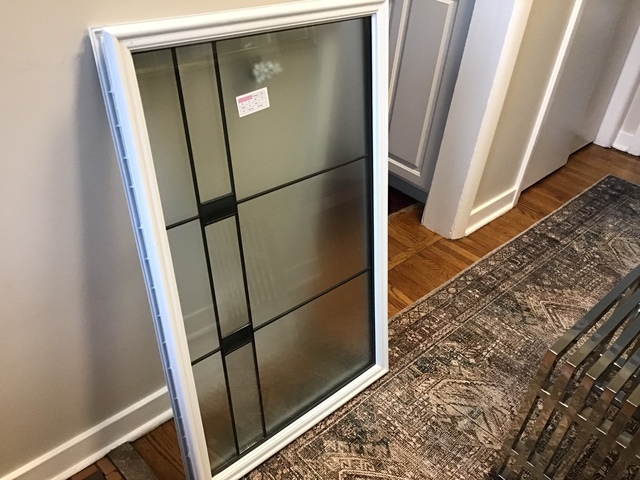 ALL TYPES OF DOORS AND WINDOW INSERTS. SPECIALTY IN CUSTOM WORK We offer an option of actual shop drawings of your custom work for you to approve before we manufacture. Sent to you via email in easy read pdf format. Up to 6 month no-charge, no interest payment plans. Cheque, Cash, Visa, Mastercard, Amex and Debit. Proud to offer an official 10 year Warranty certificate with all of our installations.